Visiting the walruses on Round Island, Alaska was one of the greatest adventures of my life. 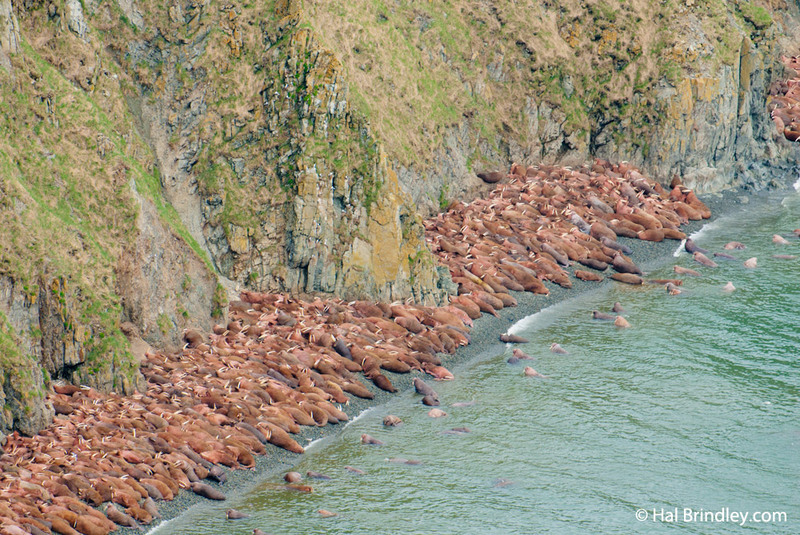 It’s hard to describe the sensation of watching thousands of these huge pink blobs all crammed together on the beach sunbathing, roaring, burping, sleeping, farting, and jabbing each other with their tusks. The walrus instantly became one of my favorite animals in the world. I hope that once you read these amazing walrus facts, you will fall in love with them too! The walrus scientific name, Odobenus rosmarus, is a contraction of the Greek words odontos and baenos, meaning “tooth walk”. Why would they be given this name? 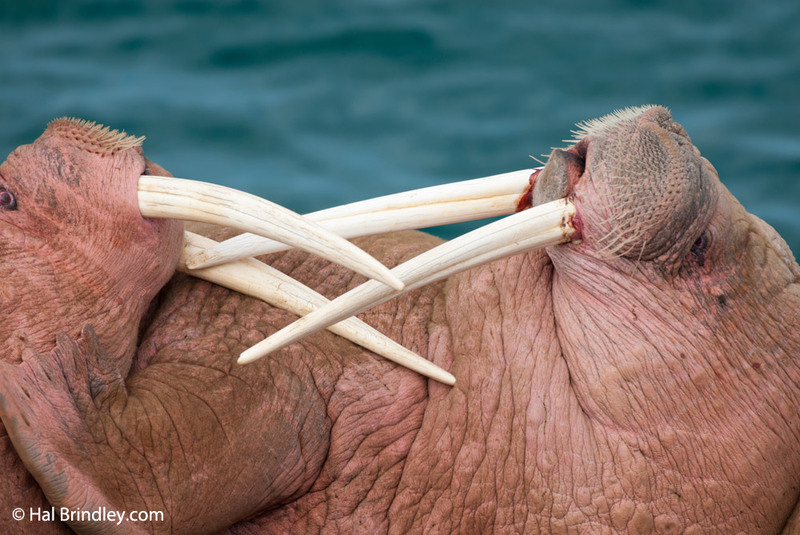 Walruses have enlarged upper canine teeth (tusks) up to 3 feet long which they use to help pull their enormous weight out of the ocean and onto pack ice. A walrus uses its tusks as a fifth limb, jabbing them into the ice as it heaves its body up and forward. 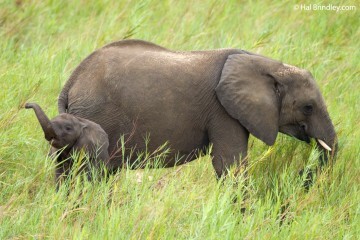 It actually looks like they are walking on their tusks, hence the name. Tusks are also used to open breathing holes in ice floes, for scratching an itch, and for fighting between males. 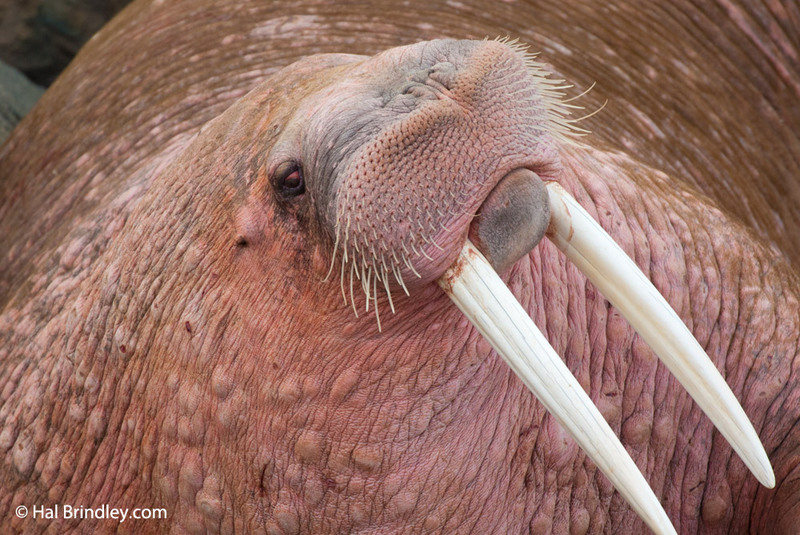 Both male and female walruses possess tusks. Walruses are generally grayish-brown in color, but their coloration changes when thermoregulating (controlling their body temperature). When in cold water, walruses have the ability to contract their outer blood vessels, reducing the blood flow to the skin and blubber, saving heat in the process. This is when the walrus appears almost white. 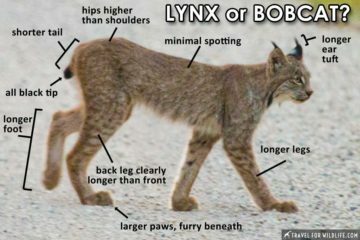 Conversely, when they are basking in the sun and warming up, the blood vessels dilate. Blood is pumped to its blubber and skin where it gets warmed by the sun. 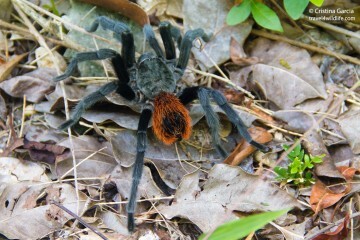 This increase in blood circulation gives them a more reddish color. 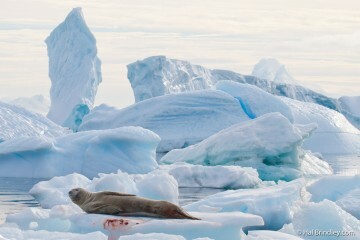 A walrus coming out of the ocean showing white skin color from a deep dive. Young individuals are darker than adults. 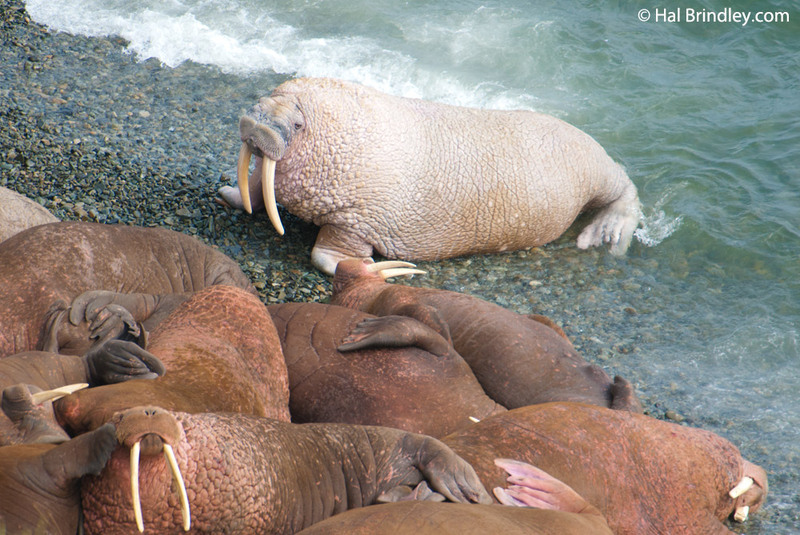 Walruses don’t look anything like a mermaid, but they do sing like one. Walruses are known for being a garrulous bunch, always engaged in constant chatter. Walruses can communicate both above and below water. 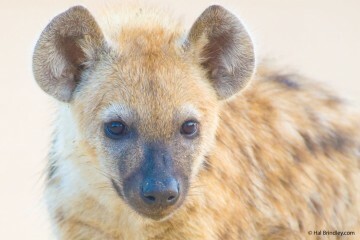 On land, their wide range of sounds include snorts, roars, barks, whistles, grunts, rasps and clicks. A bell-like sound is a produced by using one of their inflatable air sacs located in their pharynx as a resonance chamber, and is only used in sexual display. Underwater they can click, knock and tap as well as chime and strum. This sound is surprisingly delicate compared to the usual roaring and growling and burping that emanates from a large group of walruses. In fact, it sounds a bit like someone lazily strumming a ukelele under a palm tree. It is this strumming that reminds me of the old tales of sailors mesmerized by a mermaid song. When I hear this chiming I imagine a walrus playing a harp trying to entice me to swim with them. This link is a recording of a Pacific Walrus chiming, grunting, blowing bubbles, bellowing and breathing. Hear the chiming of a walrus here (there is a play button below the photo). Walrus Facts 4) Squirt. Eat. Repeat. Walruses squirt jets of water from their mouths to excavate their prey: primarily clams and other shellfish. When searching for food, walruses use their sensitive whiskers (or vibrissae) to feel their way through the sand on the ocean floor. 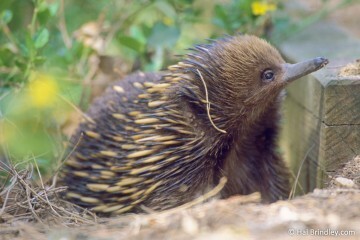 The front of their snout is covered with tough skin, which is used to dig out small clams and invertebrates. Prey which is buried deeper in the muddy bottom is excavated by jetting water into their burrows. The force of the water jet exposes a tasty morsel like a worm or a snail. Hal visited the walruses in Alaska a few years ago and has a few stories to tell. Very cute ones! I just saw sea lions a few weeks ago, and I just loved them, too 🙂 Thanks for sharing! We love seals too. They are so curious and playful! I had no idea they used their over sized teeth to pull themselves up. I’m amazed at the powers of evolution. The world is amazing. And the “song”? That was rather stunning. I was shocked by that too. Why did that EVOLVE to be a communication strategy? Fascinating. PS: garrulous – I love that word. Don’t you think they sing like mermaids? 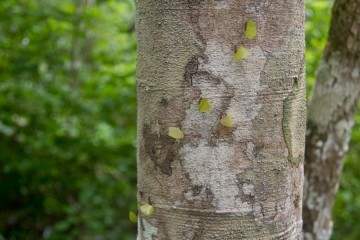 Hal was camping pretty close to them and he says he could hear them chiming. Stunning.